I obviously chose the wrong blog – type to start: I should have started a recipe/food blog. Look at Deliciously Ella whose book shot up straight to the top of the Times Bestseller’s List and ‘Julie & Julia’ which was made into a film. And Jamie Oliver who is now richer than Gordon Ramsay and worth a quarter of a billion (£240 Million). Well, I missed my calling but truthfully, I am more of an ‘appreciator’ than a ‘creator’ when it comes to food. I know how to cook, but let’s face it, I’m no Masterchef. 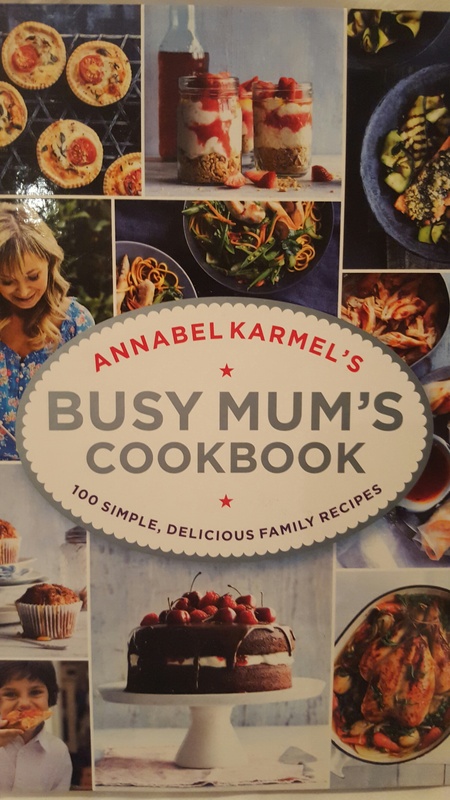 Someone else who has made her career out of cookbooks is Annabel Karmel, whom I have interviewed in the past, and is out now with a new recipe book: Busy Mum’s Cookbook. It’s not ground-breaking, highly inventive recipes necessitating 300 ingredients, half you can’t pronounce, but it does offer quick and easy, healthy, tasty meals with ingredients you probably already have at home. One section has recipes requiring less than 6 ingredients and one section has 20 minute recipes. It’s all about keeping it simple. Which, as we know, is essential in a busy household. Step One: Season the duck strips and coat them in 2 tablespoons of the plum sauce. Heat the sunflower oil in a wok or frying pan until hot and add the duck strips. Fry for 8-10 minutes until golden, then remove and set aside. Add the yellow pepper, shallot, mushrooms, sugar snap peas and pak choi leaves to the wok over a high heat and stir fry for a few minutes. Step Two: Mix together the remaining plum sauce, soy sauce, ginger and cornflour. Pour the mixture in the wok and add the cooked duck. Toss over the heat for a minute or two until heated through and serve immediately. Step One: Put the quinoa and 300 ml of water into a small saucepan. Cover, then bring to the boil. Stir and turn off the heat, then re-cover and set aside until all of the water has been absorbed. Season and leave to cool. Step Two: Place the cooked quinoa in a large bowl with the grated carrot, spring onions, corn and edamame beans. Step Three: Combine all the ingredients of the dressing in a small bowl, then add to the salad and mix well before serving. Step One: Preheat the oven 180C degrees, line 2 large baking sheets with non-stick baking paper. Step Two: Cream the butter with the sugar in a bowl until light and fluffy, then add the egg and beat again. Fold in the remaining ingredients until well incorporated. Step Three: Shape the cookie dough into 20 balls. Place on the prepared baking sheets, well spaced apart, and press down slightly to flatten. Bake for 10 -12 minutes, until lightly golden but still slightly soft in the middle. Leave to cool on the sheets for a few minutes, then transfer to a wire rack to cool completely.